Construction has begun on the Clinic Building to create an enhanced entryway and reception area. 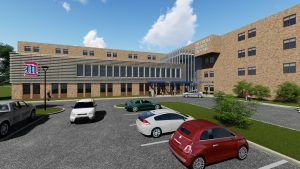 Renovation plans include an update to the front exterior, floor plan to better facilitate patient check-in and check-out, and more comfortable and inviting seating space for guests. We appreciate your patience during the next several months as the flow of routine is interrupted. As a reminder for your safety, please stay clear of all caution tape and construction zones. The project is expected to be completed by October 2019. Delta Dental Foundation has provided $630,000 in funding which will allow for a second year of the Michigan Initiative for Mother and Infant Oral Health Project (MIMIOH). 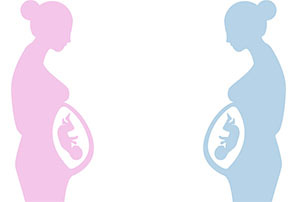 MIMIOH integrates dental services into primary care setting for at risk pregnant women to improve their and postpartum, and the infant’s oral health outcomes. The program has been pilot testing integration of a PA 161 dental hygienist into Ob/Gyn clinics providing preventive services and referrals to dental clinic as a part of regular OB care. In one year, the pilot has shown promising results. Funding will allow for expansion to four new sites and continued evaluation of the pilot. 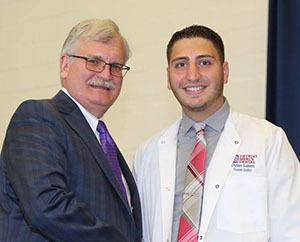 Congratulations to Dylan Salem, DS2, who was recently awarded an ADA Foundation Dental Student Scholarship for $20,000. This scholarship recognizes the dental student who is strong academically and demonstrates outstanding promise in leadership, public service/volunteerism and/or research. 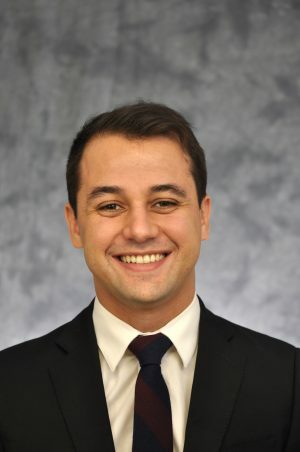 Salem serves as vice-president and lab tutor for the Student Research Group, vice-president for the Oral Facial Pain and Sleep Medicine Student Group and pre-dental liaison to ADEA. We are proud to announce the Pierre Fauchard Academy, Michigan Section will soon honor Rafael Pacheco, D.D.S., M.Sc., Ph.D., assistant professor with a Special Appreciation Award for his outstanding contributions to dentistry and service to the profession. The award will be presented at the Michigan Section Breakfast Meeting on Saturday, May 4 in conjunction with the MDA Annual Session. It is an honor to have a leader in the profession among our Detroit Mercy Dental community. Legislative leaders throughout Michigan joined us on campus on Monday, March 11. The group toured the School of Dentistry, met with the dean and conversed with students to learn about about how they can help us continue to be a leader in dental education and oral health care. It was an important visit and we are grateful for the opportunity to connect with those who create change on behalf of our profession!